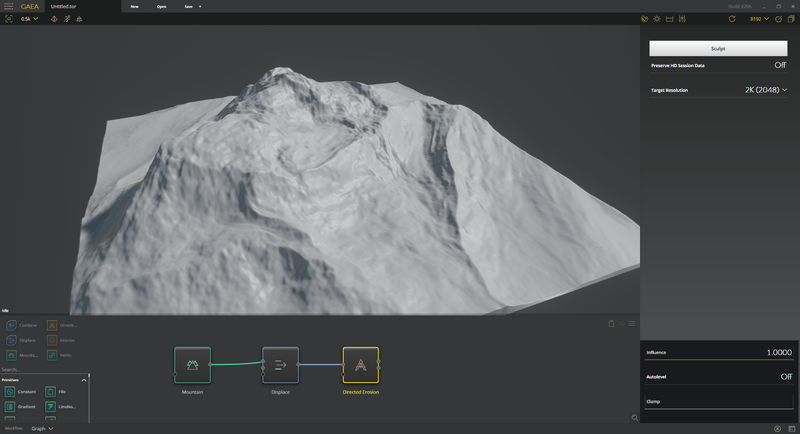 QuadSpinner published a new article that explains the workflow behind Directed Erosion in Gaea. It is worth noting that the feature is not fully production ready, but it’s still worth trying right now, so let’s get started. Let’s start with the workflow. Directed Erosion works in its own “Sculpt mode”. In this example, we have a simple setup at 512 x 512 preview resolution. When you add the Directed Erosion node, you will notice it has its own independent resolution. In most cases, this should be the final output resolution. See the Strategies section later in this article for more details. Directed Erosion is meant for fine detailing, and works at an independent resolution from the preview and final build resolutions. The Sculpt is resampled as needed. In our example, we are working with 2048 x 2048. While we finalize and optimize Directed Erosion, this resolution is capped at 8192 x 8192. We’re now ready to start sculpting. Click the Sculpt button in the editor to enter the Sculpt mode. 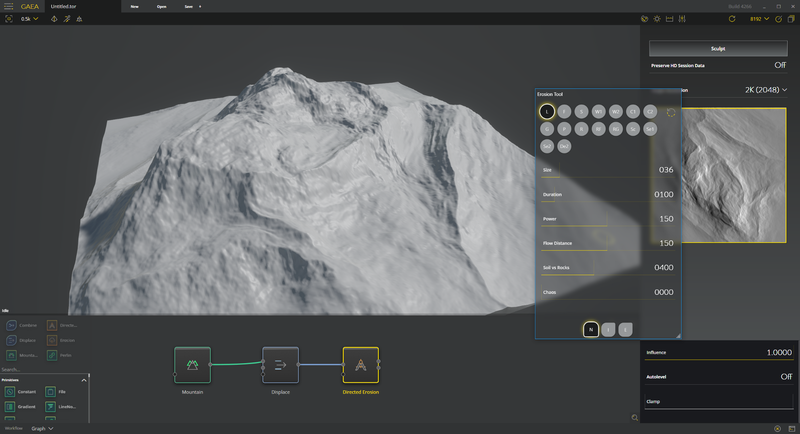 The Erosion Tool becomes available when you enter the Sculpt mode. This floating window lets you select an erosion tool, modify its setting, and choose an erosion mode. Each erosion tool creates a different effect, and some have secondary variations. LandBreaker (L) — general, all purpose erosive breakdown. Flowlines (F) — create Breaker style broad flow lines. Soil (S) — soil deposit tool. Great with Infinite Flow. WideFlow (W1, W2) — creates wide, long flows. Carver (C1, C2) — strong, rock carving. Use sparingly! Gullies (G) — create gentle, flowing gullies. Pockmarks (P) — creates small impact holes. Use for detailing. Rocks (R) — creates rock flows. Great with Infinite Flow. RoughFlow (RF) — chaotic soil/rock flows. Roughness (RG) — detailing tool for roughening surfaces. Scratch (Sc) — detailing tool for creating superficial scratches. Sedimentary (Se1, Se2) — strong soil flows. Duration — this is the effect simulation duration. Be careful when using long duration values as it can take quite some time. Get a feel for the tools before modifying this value too much. Power — this is the strength of the erosion simulation. In most cases, you should leave it as-is. When using Infinite Flow, you can increase this value without too much penalty. In Normal or Erosive modes, it can shatter the terrain and create bad debris artifacts. Flow Distance — this is how far erosive flows should reach beyond the impact area. The longer the flow, the more processing it will require. Soil vs Rocks — the granularity of the erosive material. Low values create soft soil, while high values create rocks and boulders. Normal Flow (N) — this is the default mode where erosion behaves normally. Erosion will both take away material from your terrain and deposit it elsewhere. Soil tool in Infinite Flow mode. Infinite Flow (I) — in this mode, erosive debris/material is deposited but never removed. It is great for adding soil, talus, and other material without taking away from your terrain. In other words, it generates soil and rocks from thin air. Erosive Flow (E) — in this mode the effect is the exact opposite of the Infinite Flow where material is taken away, but nothing is deposited. You can keep eroding an area without created deposits downstream. The Erosion Tool panel provides a local “in-session” undo function accessible next to the tools. You can undo up to 20 tool impacts.